This a lovely bread with Greek feta cheese. It's a wonderful accompaniment for any dish, but especially for Greek Bean Soup - Fasolada - along with olives. It's light, but tasty and nutritious and if you've never eaten it, do try it - I'm sure you'll love it! Put the flour in a mixing bowl and sprinkle the salt evenly over it. Create a small dip in the centre of the flour and add the yeast diluted in tepid water along with the honey. Mix the yeast and honey in with some flour and then let it rest in a warm place for 15 minutes. Add enough tepid water to make a pliable but not sticky dough. Knead it in the bowl enough to make it into a ball and then transfer it to a working surface and knead it for at least 10 minutes as you knead for bread. Put it back in the bowl, cover it with cling film, put it in a warm place and let it rise to double its size. Brush a shallow 36cm oven dish with the oil and place the dough in it, flattening it with the palm of your hand so that it covers the whole of the bottom of the dish. 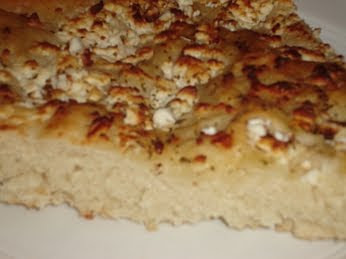 Sprinkle the crumbled feta cheese evenly over the dough, pressing it in with your fingers. Sprinkle the oregano over it. Brush the edges well with the olive oil and pour the remainder over the feta. Let it rise uncovered in a warm place for 30 minutes. Bake in a preheated oven at 250 degrees Celsius for 30 minutes or until it has a golden brown colour. You are making me hungry! That sounds pretty easy. Mmmmm, this looks fantastic! So delicious! Yes, I particularly love this bread. It's great with olives and dipping it into olive oil. As you say, Sharkbytes, it is relatively easy to prepare. It looks so yummy! In fairness huh just so easy to prepare. I wanna try it sometime. My Yiayia use to make this for me as a child. I am definitely going to make it. I know it is delicious!